Jan. 26, 2015, Anacortes, Wa. 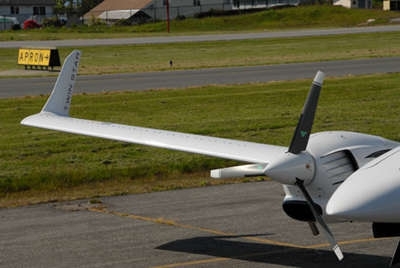 - Micro AeroDynamics has received FAA and EASA STC approval for the VG kit it has designed for the Diamond DA42, DA42NG and the DA42M-NG twin engine models. In flight tests, the addition of VGs to the leading edge of the wings and both sides of the vertical stabilizer reduced Vmc, provided a dramatic improvement in slow speed stability and handling, lowered stall speeds, reduced accelerate/stop distance and improved safety. The STC for the kit is compatible with aircraft approved for flight into known icing. In addition to improved controllability in slow flight, flight tests demonstrated Vmc is reduced by 9 KIAS, Vs comes down by 5 KIAS and Vso slows by 7 KIAS. Rate of climb increases by 150 fpm and there is no measurable loss of speed in cruise settings. Micro VG kits come with the STC, all required installation tools, detailed drawings and illustrated instructions, templates for properly positioning the VGs, spares, and Loctite Depend 330 for permanent adhesion. Once in place, Vortex Generators are effective in keeping the boundary layer attached to the flying surfaces at slower speed, expanding the envelop for positive aileron and rudder control while landing or taking off. The complete package can be installed easily in one day. VG Kits for the DA42 series are pre-painted “Diamond White” and sell for $2,450 plus shipping and handling.